Earlier this week, the coup goverrnment in Egypt sentenced 529 protesters to death in a simultanious "trial" for the alleged killing of a cop during protests last summer in which hundreds of protesters were shot. On the 27th of March, Code Pink showed up in front of the Egyptian Embassy to condemn this outrageous violation of human rights. 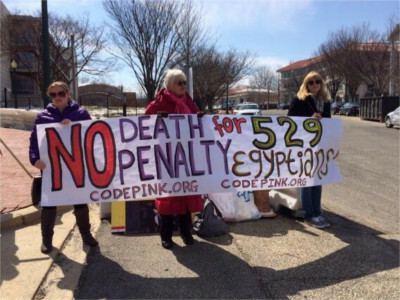 Code Pink will be returning to the Embassy of Egypt at noon on Saturday, March 29. Already the illegal military coup government in Egypt is broadening their crackdown to lump secular liberals as well as with the Muslim Brotherhood. Let's put this in perspective in terms of the unprecedented numbers: 529 death sentences is only slightly less than if all the arrestees at Pershing Park or at the April 15th, 2000 IMF march had been sentenced to death. I read somewhere that there are no records of any court on the planet under any regime in modern history (if ANY history) ordering this many death sentences in a single trial. If this is allowed to stand, a new standard for the use of force against protesters globally will be established. This, in turn, could make executions of Indigenous protesters against oil and gas extraction (like what Shell did in Nigeria in 1993) frequent and common. In other news, Egyptian Field Marshal Abdel Fattah Sisi is running for President of Egypt after stepping down from his role as defense minister. The Obama administration claims this mass sentencing will be a factor in whether or not to renew US aid to Egypt. Now, with another 900 activists facing similar excuses for "trials," it's time to see if Obama's words are worth anything!